Welcome to Handley’s Café where you can relax with a cup of our own blend coffee and cake, meet with friends over breakfast or lunch or sample one of our amazing milkshakes or healthy smoothies. Handley’s is ‘THE’ place to be at any time of the day so come and find out why we have created such a buzz in Ashtead! We are passionate about serving excellent quality fresh food from our kitchen. We use the finest ingredients and cook everything from scratch. Breakfast times at Handley’s is always a memorable experience, but we’re not just about eating. Relax with a pastry and cappuccino whilst reading the paper, or indulge in our cake selection with a wide range of gluten free options made by us on the premises. We are also available for private hire, just enquire with Hannah or Neil for information. Handley’s Café are delighted to announce that we have been awarded the FSA 5 Star rating, the highest a business can achieve for food hygiene. The ‘Food Hygiene Rating Scheme’ is based upon a nationally recognised initiative, supported by the Food Standards Agency (FSA). 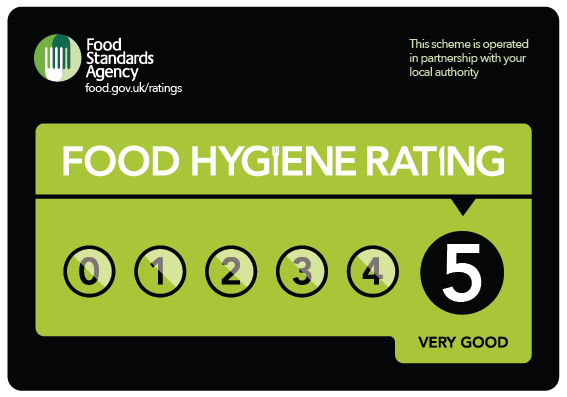 Each business is given a ‘hygiene rating’ from 0 to 5 when it is inspected by one of their food safety officers. The hygiene rating shows how closely the business is meeting the requirements of food hygiene law.